The Intoxilyzer 8000 is an infrared analyzer manufactured by CMI, Inc., based on Owensboro, Kentucky. 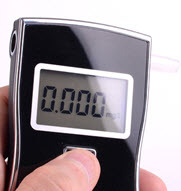 Broadly speaking, the instrument measures the amount of infrared light absorbed by ethyl alcohol as contained in a breath sample provided by a DUI suspect. Since the concentration of the alcohol in the alveolar air released from a person’s lungs is directly related to the concentration of the alcohol in the blood, a measure of breath alcohol level will indicate whether a person is over the legal limit. The Intoxilyzer 8000 analyzes a person’s breath on the basis of infrared absorption. A lamp contained within the instrument generates an infrared beam, which is passed through the subject’s breath sample. Since ethyl alcohol absorbs infrared wavelengths at a 3.39 to 3.48 micron range, absorption of wavelengths at this range will indicate that the subject has alcohol in his or her system. The amount of infrared light absorption at that particular wavelength can then be used to determine how much ethyl alcohol is in the subject’s system. One of the key problems with the Intoxilyzer 8000 is that the instrument does not measure specifically for ethyl alcohol. Any organic molecule within the so-called “methyl” group of organic compounds (including acetone, methyl alcohol, diethyl ether, acetaldehyde) will absorb infrared light in the same manner as ethyl alcohol. If these compounds or molecules are present in the subject’s system, they will grouped simply as “ethyl alcohol.” This can lead to unreliable blood alcohol content measurements. Methyl group molecules can be present in a person’s breath for a variety of reasons aside from of consumption of alcoholic beverages. Some occur naturally in the human breath, while others can be present by inhaling gasoline fumes, and fumes from glue, paint, lacquer thinner, chemical cleaners, and even smells from your car. The study author also notes that there is a high likelihood that police will stop a person while he or she is still in the absorptive state. Thus, the author concluded that breath alcohol measurements are not a reliable measure during the absorptive state. * Medical conditions: Gastroesophageal reflux disease, or GERD, may cause stomach contents, like alcohol, to come back up through the esophagus, which may affect the results of the test. Operator errors: If the breath test operator is unlicensed or has an expired license, the Breathalyzer test results are inadmissible. Simulator solution errors: If the person administering the test failed to include the value of the simulator solution used in the machine, the results may be inadmissible. Testing errors: The Breathalyzer machine measures your blood alcohol content at the time of the test — not while you were driving. If the testing is not conducted on a timely basis, the test results may not be accurate. Breathalyzer machine errors: If the Breathalyzer machine is malfunctioning, is either not calibrated or is improperly calibrated, or the machine is not approved in Florida, the results are inadmissible. Chemicals that interfere with breath test results: Some common products such as nail polish and cough syrup contain alcohol and can interfere with Breathalyzer test results. Chemicals such as acetaldehyde, acetone, and toluene can also be read as alcohol. If the breath test results can be successfully challenged, then the police may not have the evidence they need to convict you of drunk driving. Our experience as former prosecutors allows us to give you an honest evaluation of your breath test results so that you will know your options from the start. Fight your case the smart way — with an expert in criminal law. Hire a Board Certified Trial Criminal Lawyer. Nicholas Gianni Matassini is Board Certified in Criminal Trial Law and is AV Rated by Martindale-Hubbell. Contact The Matassini Law Firm, P.A. for a free confidential consultation.